Opening words of possibilities for avid goat fans all around the world. Sometimes, a game releases and its whole point for existing is to be intentionally bad. These games, rarely ‘good’, are intensely hard to review, as it’s hard to find what is intentionally horribly placed or programmed and what isn’t. Luckily, Goat Simulator is nothing new, the game released on April Fool’s Day back in 2014 and has since become a global phenomenon, bringing cutting edge Goat Simulation technology to the stage. It’s a game that has no real clear objective, end-game or story and it’s all about being a goat. Yes, it’s that simple. The gameplay of Goat Simulator is extremely straightforward. You play as a goat and do ‘goat things’. As expected, the life of a goat is pretty boring, running up the sides of skyscrapers, robbing banks and causing zombie outbreaks are just a small example of the many activities you’ll have access to as a goat, and yes, even though being a goat does sound pretty bland, sometimes you can even have access to eating grass, which is a treat within itself and is definitely a highlight of my gaming experience. Goat Simulator’s appeal is its silly physics engine and absurd glitches, bugs, and overall presentation. While the game still retains its hilarious (yet sometimes frustrating) physics and controls, as well as its classic physical glitches and bugs, the game’s presentation is a massive let-down. For a game that feels like a default asset-packed Unreal Engine tech-demo (this isn’t a bad thing) it runs and looks horrendous. The frame-rate dips often, especially when doing something that isn’t walking or jumping and loading into an area with more than one moving object has an apparent strain. The graphics look like something ripped from the Wii, or an extremely low-end Windows XP PC – while graphics aren’t necessarily ‘important’ in Goat Simulator, it’s a shame that the game wasn’t at all pleasing to look at, especially when contrasted to its other console versions. As always, Goat Simulator hits the nail on the head with its comedy. Satirical pop-culture references are littered throughout the game and the sheer absurdity of the game, as well as the self-awareness and parodies that it shows, is perfect. While not everyone has the same taste in humour, Goat Simulator, without a doubt has something for everyone, and even after having years of experience with the game, I still let out a chuckle or two after something hilarious happens… or doesn’t. 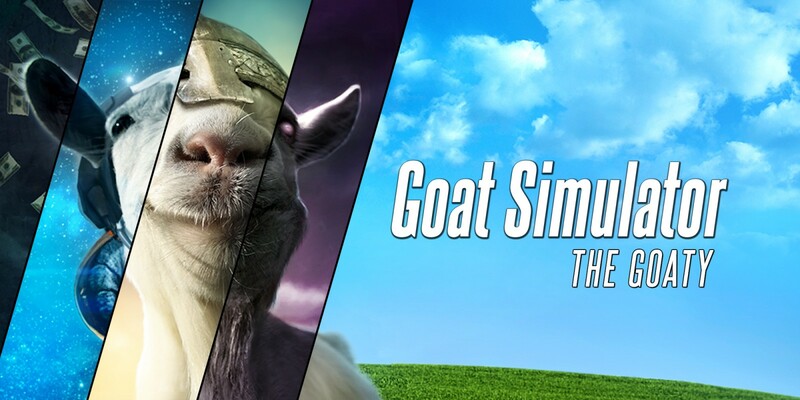 This re-release of Goat Simulator is aptly named ‘The GOATY’. It comes with all major expansions that have been released since the game’s original inception packed with more content than ever, unfortunately with Goat Simulator, it’s how you find ways to spend time with this content that will keep you busy, as not many of the game modes, expansions or much of the game, really pushes you to do anything. You’re occasionally given small ‘achievements’ for doing specific things, but it’s always up to the player to decide whether they want to kickstart a business, collect trophies, find new goat species or defy the laws of physics. While this does sound all fun and dandy as a throwaway passing of time, the quality of this overwhelming amount of content is extremely lacklustre and is disappointing to see from such a ‘classic so-bad-it’s-good game’. I was pleasantly surprised with the expansions at first, as I had never experienced them before and they felt fresh and fun, but once again, after only a few hours, the bore plague striked. After a little while tinkering with the different mechanics gameplay variations they had to offer, I’d end up either bored or confused. My favourite, by far, however, was GoatMMO. It is a massive spoof on the fantasy-MMO genre, with naturally dumb NPCs, a faux chat-box and selling system and had me genuinely believing I was connected to a server for the first hour of play. It’s the creative gameplay choices like this that really makes me love Goat Simulator. It’s so spontaneous, wild and creative that I find myself struggling to pinpoint another game that does this genre of gameplay and comedy so well. While the other expansions definitely have substance and a lot of wildly different genres and gameplay ideas, such as a GTA Vice City parody, a DayZ-like game mode that is more polished than DayZ actually is, and a massive satirical take on crowdfunding websites – there’s a genre, style and gameplay decision made for virtually everyone. It just takes some time to figure out what you want to do with the game, and when you do, it’s sure to provide you with plenty of free time to waste. Overall, Goat Simulator: The GOATY is an okay game. It’s filled to the brim with content and things to do, but as always with a game like this, it’s up to the player to decide best how their time is spent. I’ve always loved the ‘satire’ genre of video-games and the now almost 5 year old Goat Simulator is definitely a culmination of everything I want in a game like this. It’s just a shame that I was never able to find my footing due to the performance, controls and graphical concerns. If you’ve been interested in the game or genre before, then I’d give Goat Simulator a try, it’s just a question of whether or not the Switch is the right console to play it on is entirely up to you.